In March of 1997, an unusual event occurred in the night skies of Arizona which have been dubbed the Phoenix Lights or the Incident at Phoenix. This mystery actually started in Southern Nevada over the town of Henderson, NV.Then reports of strange lights over the Arizona towns of Paulden, Prescott, Prescott Valley, Dewey, and Phoenix. 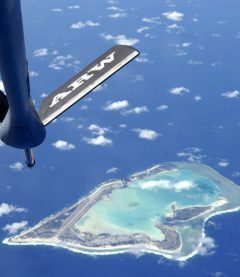 Low altitude, possibly 1,000 feet or lower. Absolutely no sound or noise. Moving at a speed so slow that no aircraft could stay in the air at that speed. Then accelerate to unknown speeds. Fife Symington was Arizona Governor at the time, also witnessed the event at a nearby park. The Governor would later hold a Press Conference and ridicule and mock the event to the ire of many witnesses. Later Governor Symington would apologize at a Conference at the Press Club in Washington DC. In fact, he criticized public officials who would “run and hide” instead of admitting they didn’t know what this event or any unusual happening was. So often career advancement does not allow an ambitious government official to be involved in any way in anything “outside-the-box”. One has to applaud Governor Symington for admitting what he saw and admitting that he handled the situation in a wrong manner at first. 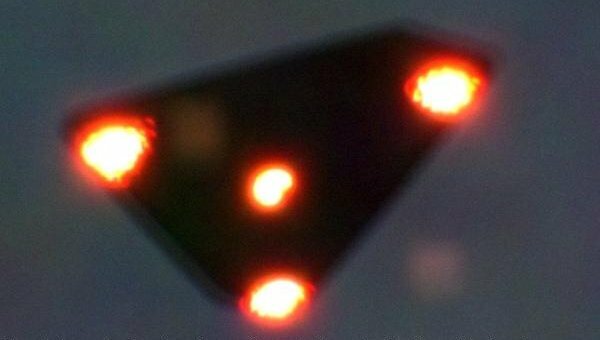 Most witnesses said what they saw was usually 5 lights in a “V” formatting, very low to the ground, very slow in speed perhaps as slow as 30-40 mph, and absolutely no noise at all. The time of this event was from 20:15-20:40 hours (8:15-8:40 PM), depending on what part of the Valley where you were when you saw the object. Then the “object” continued Southeast and accelerated to speeds unknown. The second event of the “The Phoenix Lights” occurred around 2200 (1000 PM) to the southwest part of the city. There were several “home videos” taken of this event. This event appeared to be different in the fact that several lights (more than 5) came on one by one. The Air Force said they were dropping flares over the Goldwater Practice Range at that time. After viewing the videos, many said that if they were flares, there would be some change in there (flares) position in the formation, but the lights remained perfectly straight information. Although the winds aloft at that altitude were light, the “flares” would have moved a little even in light winds. Also, flares leave a smoke trail from the burning phosphorus, there was no indication of this in the videos. 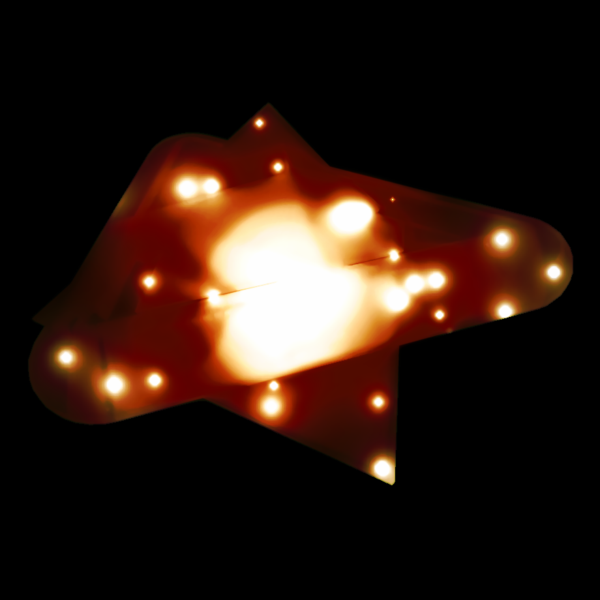 In addition, the parachutes would illuminate from the flare, even a small amount, but there was no indication of any parachute illumination. The lights of this Event Two last several minutes, 5-10 minutes as it is estimated. Just as they came on (9-10 lights), they went out one by one. Thus ended this very unusual evening activity. Besides the “main events” in Phoenix. The “triangle” was seen in Tucson as a “battleship gray” color. This event occurred about 2100 hrs (9:00 PM) and lasted for just a few minutes and was witnessed by a handful of people. If it were low flying aircraft or helicopters, they would make noise. That is what was so unusual about the sightings was there was absolutely –NO NOISE. There was an explanation given by an ex-Air Force officer that the first event was 6 /A-10s flying at 15,000 feet traveling from Nellis AFB Las Vegas to Davis-Monthan AFB Tucson AZ. I live about 25 miles from Davis-Monthan AFB and there are many A-10s stationed there. Quite regularly A-10s fly over our house at alludes at 10,000 feet and higher. While that is pretty high there is no question about hearing engine whine even if it is not too loud. The Lights Over Phoenix were reported as very low. 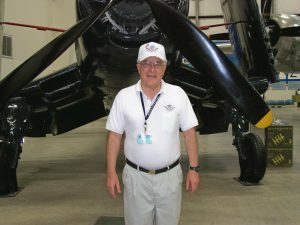 So we can rule out any type of known aircraft. Since there were at least 10,00 reports of eyewitnesses to the event, we can dismiss that possibility. The fact is the government wants their experiments to be “unnoticed” and kept secret rather than plastered across the news media. So we can rule out Experimental Aircraft. 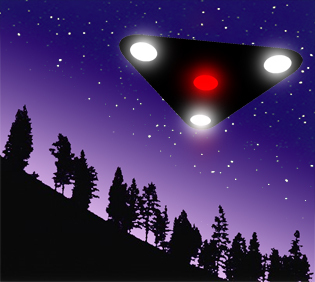 There are several individuals from the Phoenix area and elsewhere too, that think that we were visited by “aliens” I am leaving that explanation to you, the reader, to determine if you think that is true. Do we have the capability to produce holographs that could fool thousands of people? That might be an experiment that the government might consider to see how it would work on a populous area (if we had the technology). If this worked we would have an enemy chasing after tanks and aircraft there were mere images. Finally, do I have a definitive explanation for “The Incident at Phoenix”? I am sorry but I am with the thousands throughout the world who regard this as a great unsolved mystery. 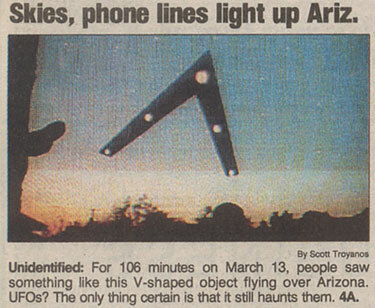 March 13, 1997, was indeed an interesting night for the residents of Arizona. THANKS FOR READING. I HOPE THIS WAS INFORMATIVE! Next Next post: Are UFOs Real?